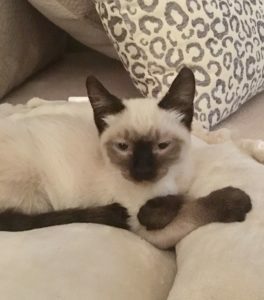 Cat Litter Box Problems: Chloe's Story | Purrrfectly Holistic...a Boutique for Cats! Purrrfectly Holistic…a Boutique for Cats! 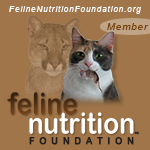 There are several reasons why cats stop using their litter box. It’s so important to rule out an underlying health condition such as urinary tract infections, cystitis, and bladder stones or blockage. If you’re certain your kitty is not compromised in these areas it’s time to think like a detective. Negative association of the litter box to a previous, painful health condition, etc. It’s easy to see why pet parents give up when there are so many variables. It’s important to remain patient and rule things out until you’re able to find the cause of the inappropriate behavior. Usually cats will give you clues as to why they’re not using their box–are you missing them? 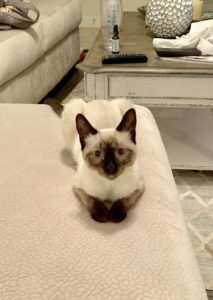 One of my friends, Tiffani, adopted an adorable Siamese kitten in early November 2018. Some people had rescued her from a dumpster and posted her photo on a neighborhood social media site. The minute Tiffani saw her she was smitten. She was so tiny, very skinny, and a bundle of energy. She would follow Tiffani everywhere, always getting underfoot, and she quickly settled in to her new forever home with fellow resident tripod kitty Tre’. Over the Thanksgiving holiday Chloe was boarded a couple of nights at the vet’s clinic while her family went out of town. Being so small she surprised everyone, including her vet, when she went into heat around the end of November. Around mid-December I asked Tiffani how things were going and found out that Chloe had started spraying, which some female cats do, and this only exacerbated the chaos she was causing in the home. I recommended using Animal Relief Formula, a flower essence blend that works wonders in calming kitties who are marking/spraying and having litter box issues. Having dealt with marking issues in my own home several years ago I know first hand how frustrating and difficult it can be. When her cycle finally ended she was spayed. Around the end of December I asked Tiffani for an update . Chloe had stopped spraying but now there were litter box problems. She started peeing on the couch instead of using her litter box. They would catch her making “digging” motions on the sofa where where had peed before, and Tiffani had spent a small fortune having it professionally cleaned. As a result Chloe had to spend her days alone in the master bathroom when the family was gone, and she was most unhappy about it! As I listed to her describe it to me I had an idea. Maybe she doesn’t like her litter? The only litter they had been using since getting Tre’ was a pellet style called Breeze, and Chloe had adjusted to it nicely when she first moved in. However, the time spent at the vet for boarding and surgery exposed her to a clay, granular litter. 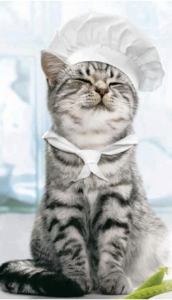 As we all know, cats can change their minds! 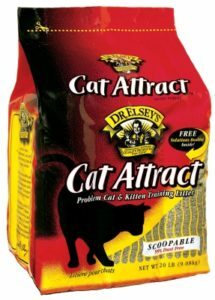 So it was agreed that Tiffani would experiment with changing her litter and using a clay-based, scoop-able litter that I have been using for years: Dr. Elsey’s Precious Cat Cat Attract. The very next day I received a text from Tiffani: “You are my hero! Chloe LOVES her new litter box. That was totally the problem! !” As soon as the new litter/box was put down for her she immediately used it. Then she sat in it with the happiest look on her face! She’s like a different cat! Tiffani is still using the Animal Relief Formula for a couple more weeks as Chloe transitions to the new litter and litter box and to reinforce the new behavior. Despite going through a rough patch, their relationship is restored again and peace has returned to their home. It’s so important to remember that it is not our cat’s intention to make our lives miserable. They are trying to communicate to us, and we aren’t speaking the same language. Be patient, put on your detective’s hat, and use your powers of observation. The answers are right in front of us–we just have to see things through our cat’s eyes. Great job Pam! I am so grateful for your investigation skills. We are back to being a happy household. Awesome, happy ending. Pam you are wonderful! Also, Apollo is doing great, Deanna is still giving him the pet wellbeing kidney support. Thank you for all you do!! That is the best news!!!! Thank you!